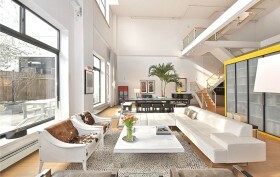 Loft lovers will appreciate what this apartment at 535 Dean Street, in Prospect Heights, is delivering. The large, open living space–perfect for that flexible loft floorplan–boasts 12-foot-tall ceilings and wall-dominating windows. 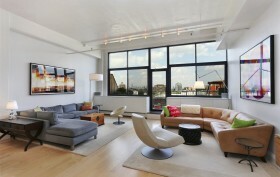 In addition, there are two bedrooms and a customized loft space built out by a local Brooklyn designer. 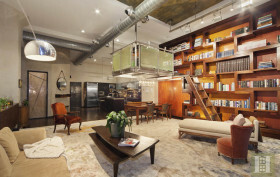 This apartment, with its many built-ins and creative bedroom spaces, is now asking a hair over $1 million. The somewhat anomalous Newswalk building at 535 Dean Street in Prospect Heights was developed by the somewhat notorious Shaya Boymelgreen (who, for the record, is not known for aesthetically pleasing designs) just before the neighborhood became popular. The condo conversion named for its former life as the 1927-built New York Daily News printing plant doesn’t fit into any of the latest crop of easily dismissible residential building categories. There’s a certain credibility to be had, both from an invasive and a pioneering spirit in this complex neighborhood. And that makes its residences unique if a little confusing. This latest offering is no exception. 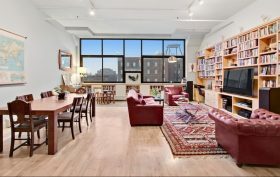 The two-bedroom penthouse loft’s interior design looks more Manhattan than Brooklyn, which may help explain the asking price of $5.9 million. Private outdoor space goes on for days, as does the list of building amenities–and there are a few surprises. So what’s with that home theater? Get ready to feast your eyes on this stunning Prospect Heights loft located in the Newswalk Condominium–and unlike anything offered on the Brooklyn market today. Every detail was masterfully created by award-winning designer Joe Ginsberg, from original furniture pieces fabricated in the artist’s atelier and included with the home to the specialized techniques and processes used in creating the distinctive wall and ceiling finishes. Built in 1927, 535 Dean Street once housed the printing facility for the New York Daily News. For over 70 years the nightly presses delivered the latest local happenings to millions of New Yorkers in time for their morning coffee. These days, thanks to a 2002 condo conversion, residents can read their morning paper in grand style (though we aren’t sure if the New York Times is permitted on the premises). Extra! Extra! Read More About It!